Do you ever get tired of spending money on things that you just throw away after one use??? So, years ago, when Jeff and I first got married, we were POOR. I mean, really poor. Like he didn’t have a job (he got laid off two weeks before the wedding… good times) and I was in school full time. I was, by nature, a cheapskate (and proud of it! I see nothing derogatory with that term, lol!) and I set out to save every little penny we could. One thing, though, that didn’t occur to me at the time was to quit buying paper towels and napkins! Every kitchen I had ever been in always had a roll of paper towels either sitting in the holder on the counter, or hanging in the holder underneath a cabinet. You guys know what I’m talking about, right? And according to TV, you HAD to have paper towels to clean up kitchen messes. I mean, heaven forbid you use a rag (gasp!). As the years went by, I became more and more interested in homesteading, living sustainably and becoming less dependent on the store (Wal-mart, I’m looking at you!). Which meant finding alternatives to previous must-have things. So, one day, I didn’t refill the paper towel holder and my cute rooster napkin holder and never looked back! I get asked the question, but what do you use instead??? 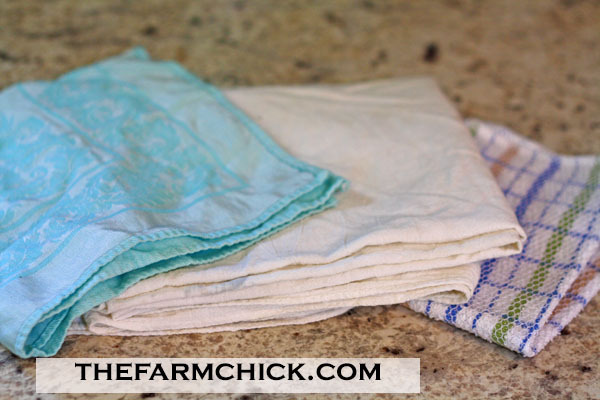 Short answer- tea towels (or flour sack towels, but around here everyone calls them tea towels), kitchen towels, dishcloths, cloth napkins, and rags (mostly cut from Reece and Jeff’s old T-shirts). This is my towel drawer! I have things in constant rotation, though. There are always towels in use, towels in the washer, and towels hung up! OK, so that wasn’t a very short answer, but here’s my long answer for how you replace your disposable paper towels and napkins. First of all, I keep a large stack of those white tea towels in the my kitchen drawer. They are extremely universal and get used for almost everything, lol! Spill something on the floor? Need to dry a dish? Need to drain the grease off of your morning bacon? Need to cover a plate in the microwave? OK, here’s how I use a towel to drain grease. I cover the plate (see it sticking out to the right?) and leave part of the towel hanging off. I lay the bacon or whatever it is on the towel on top of the plate, then I use the excess towel to blot it. If I don’t need to blot anything, then I’ll double the towel again on the plate so nothing is hanging off. Are you getting the picture yet??? 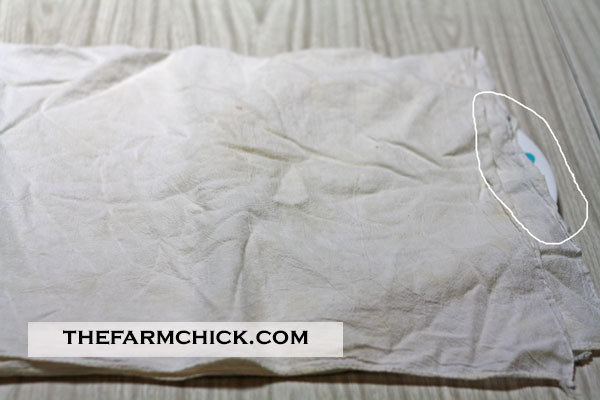 And yes, I’m sure you may have gasped that I use a cloth towel to drain my grease (and this just isn’t for bacon, but also for anything I fry), but we don’t get lint in our food and yes, the towel gets pretty dirty, but it gets washed and I live on a working farm with a working kitchen. We aren’t real concerned about stains around here 😉 Never be afraid to actually USE your kitchen stuff, K?? Seriously, though, after whatever meal it is, I just toss the greasy towel in the washer with a load of whatever I need to wash and it turns out just fine. 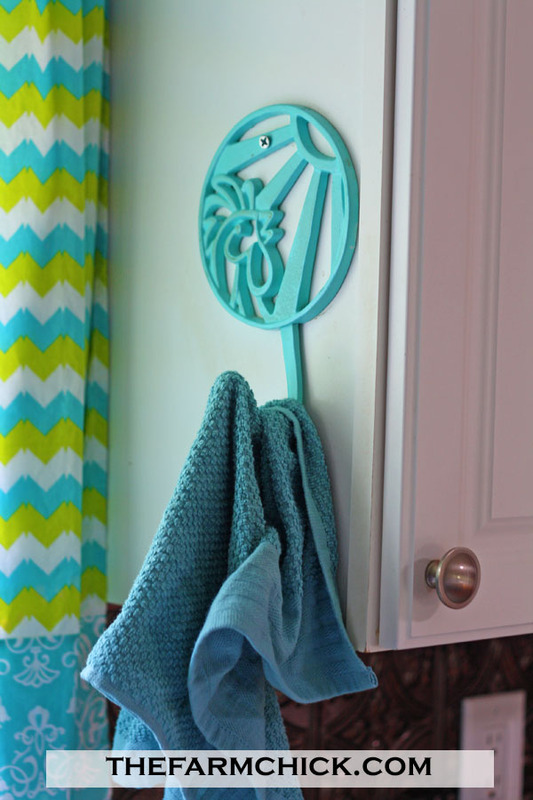 I have a cute aqua rooster hanger hook that I attached to the side of my cupboard by the sink and that’s where I hang a regular kitchen hand towel. This towel is primarily used for drying our hands (I don’t know about you, but when you work outside and cook three meals a day, a LOT of hand washing happens around here!). It’s very handy and easy to throw back on the hook when we’re done. I highly encourage you to keep a towel hung out of the way, but very accessible in your own kitchen! 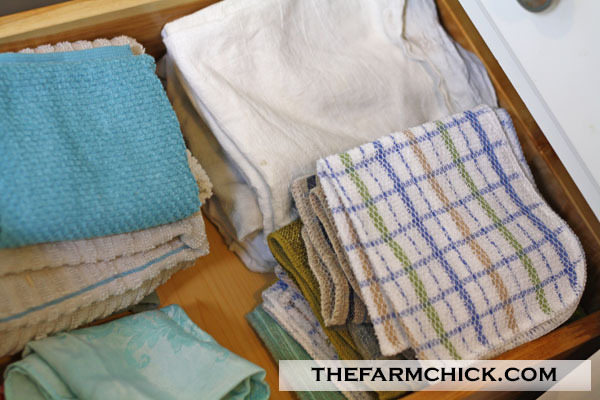 I use dishcloths for washing dishes, wiping off the counter and table, etc. If I have chicken juice or something on my counter, I either spray it with vinegar before I wipe it, or I grab a Norwex Eviro cloth (yes, I kind of sell Norwex, but this isn’t a sales pitch. I’m just telling you what I use in my own kitchen!). We keep a big box of rags (like I said before, primarily cut up T-shirts from the boys around here) in the pantry closet. We use those for the nasty-you-don’t-want-to-possibly-contaminate-your-kitchen-cloths messes. Like dog accidents (we have two dogs in the house!) or the occasional stomach flu issue. How cute is that aqua napkin??? I found a set at a garage sale with a matching table cloth. Have fun with your napkins! My second reason for loving cloth napkins is they are so much cuter!!!! I love picking up vintage napkins at garage sales or antique shops. I’m not scared to use them, because what’s the fun of a gorgeous vintage napkin if it’s just packed away in a drawer somewhere?? I want to see them! They make me smile and give me joy and we can all use that during our days, right?? Plus, they can make even the most mundane meal seem almost elegant! 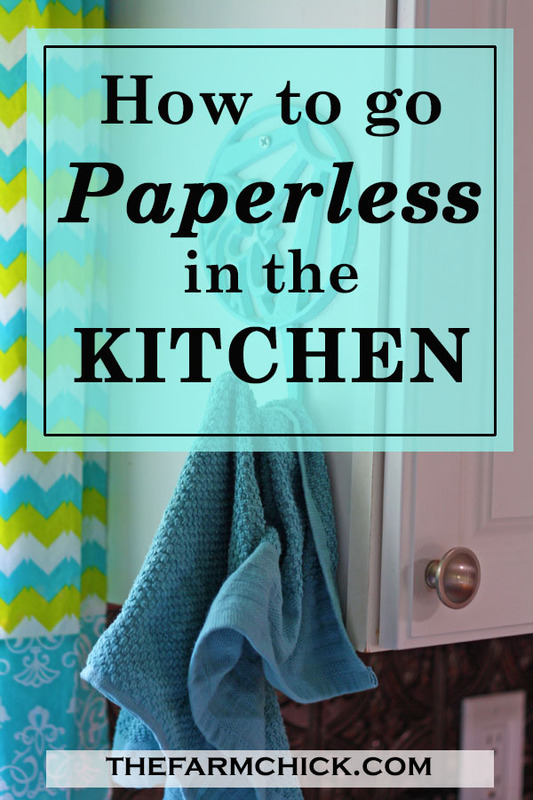 How do you go paperless in the kitchen? 1– Use up the last of your paper towels and napkins. 3– Use your new cloth stash for years to come! 4-And if you really want to be frugal and green, skip using the dryer and hang them out on the line to dry! Any questions? How many of you already do this?